The Ordovician, named after the Celtic tribe of the Ordovices, was defined by Charles Lapworth in 1879 to resolve a dispute between followers of Adam Sedgwick and Roderick Murchison, who were placing the same rock beds in northern Wales into the Cambrian and Silurian systems, respectively. Lapworth recognized that the fossil fauna in the disputed strata were different from those of either the Cambrian or the Silurian systems, and placed them in a system of their own. The Ordovician received international approval in 1960 (forty years after Lapworth's death), when it was adopted as an official period of the Paleozoic Era by the International Geological Congress. 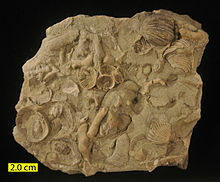 External mold of Ordovician bivalve showing that the original aragonite shell dissolved on the sea floor, leaving a cemented mold for biological encrustation ( Waynesville Formation of Franklin County, Indiana). For most of the Late Ordovician life continued to flourish, but at and near the end of the period there were mass-extinction events that seriously affected planktonic forms like conodonts and graptolites. The trilobites Agnostida and Ptychopariida completely died out, and the Asaphida were much reduced. Brachiopods, bryozoans and echinoderms were also heavily affected, and the endocerid cephalopods died out completely, except for possible rare Silurian forms. The Ordovician–Silurian extinction events may have been caused by an ice age that occurred at the end of the Ordovician period, due to the expansion of the first terrestrial plants,  as the end of the Late Ordovician was one of the coldest times in the last 600 million years of Earth's history. It was long thought that the first true vertebrates (fish — Ostracoderms) appeared in the Ordovician, but recent discoveries in China reveal that they probably originated in the Early Cambrian. [ citation needed] The very first gnathostome (jawed fish) appeared in the Late Ordovician epoch. In the Middle Ordovician, the trilobite-dominated Early Ordovician communities were replaced by generally more mixed ecosystems, in which brachiopods, bryozoans, molluscs, cornulitids, tentaculitids and echinoderms all flourished, tabulate corals diversified and the first rugose corals appeared. The planktonic graptolites remained diverse, with the Diplograptina making their appearance. Bioerosion became an important process, particularly in the thick calcitic skeletons of corals, bryozoans and brachiopods, and on the extensive carbonate hardgrounds that appear in abundance at this time. One of the earliest known armoured agnathan (" ostracoderm") vertebrate, Arandaspis, dates from the Middle Ordovician. Green algae were common in the Late Cambrian (perhaps earlier) and in the Ordovician. Terrestrial plants probably evolved from green algae, first appearing as tiny non- vascular forms resembling liverworts. Fossil spores from land plants have been identified in uppermost Ordovician sediments. The ice age was possibly not long-lasting. Oxygen isotopes in fossil brachiopods show its duration may have been only 0.5 to 1.5 million years. Other researchers (Page et al.) estimate more temperate conditions did not return until the late Silurian. The late Ordovician glaciation event was preceded by a fall in atmospheric carbon dioxide (from 7000 ppm to 4400 ppm). The dip was triggered by a burst of volcanic activity that deposited new silicate rocks, which draw CO2 out of the air as they erode. This selectively affected the shallow seas where most organisms lived. As the southern supercontinent Gondwana drifted over the South Pole, ice caps formed on it, which have been detected in Upper Ordovician rock strata of North Africa and then-adjacent northeastern South America, which were south-polar locations at the time. ^ Haq, B. U.; Schutter, SR (2008). "A Chronology of Paleozoic Sea-Level Changes". Science. 322 (5898): 64–68. Bibcode: 2008Sci...322...64H. doi: 10.1126/science.1161648. PMID 18832639. ^ Wellman, C.H. ; Gray, J. (2000). "The microfossil record of early land plants". Phil. Trans. R. Soc. B. 355 (1398): 717–732. doi: 10.1098/rstb.2000.0612. PMC 1692785. PMID 10905606. ^ Details on the Dapingian are available at Wang, X.; Stouge, S.; Chen, X.; Li, Z.; Wang, C. (2009). "Dapingian Stage: standard name for the lowermost global stage of the Middle Ordovician Series". Lethaia. 42 (3): 377–380. doi: 10.1111/j.1502-3931.2009.00169.x. ^ Heck, Philipp R.; Schmitz, Birger; Baur, Heinrich; Halliday, Alex N.; Wieler, Rainer (2004). "Fast delivery of meteorites to Earth after a major asteroid collision". Nature. 430 (6997): 323–5. Bibcode: 2004Natur.430..323H. doi: 10.1038/nature02736. PMID 15254530. ^ Haack, Henning; Farinella, Paolo; Scott, Edward R. D.; Keil, Klaus (1996). "Meteoritic, Asteroidal, and Theoretical Constraints on the 500 MA Disruption of the L Chondrite Parent Body". Icarus. 119 (1): 182–91. Bibcode: 1996Icar..119..182H. doi: 10.1006/icar.1996.0010. ^ Korochantseva, Ekaterina V.; Trieloff, Mario; Lorenz, Cyrill A.; Buykin, Alexey I.; Ivanova, Marina A.; Schwarz, Winfried H.; Hopp, Jens; Jessberger, Elmar K. (2007). "L-chondrite asteroid breakup tied to Ordovician meteorite shower by multiple isochron 40Ar-39Ar dating". Meteoritics & Planetary Science. 42 (1): 113–30. Bibcode: 2007M&PS...42..113K. doi: 10.1111/j.1945-5100.2007.tb00221.x. ^ Stanley, S.; Hardie, L. (1998). "Secular oscillations in the carbonate mineralogy of reef-building and sediment-producing organisms driven by tectonically forced shifts in seawater chemistry". Palaeogeography, Palaeoclimatology, Palaeoecology. 144 (1–2): 3–19. Bibcode: 1998PPP...144....3S. doi: 10.1016/S0031-0182(98)00109-6. ^ a b c d e f g h Munnecke, A.; Calner, M.; Harper, D. A. T.; Servais, T. (2010). "Ordovician and Silurian sea-water chemistry, sea level, and climate: A synopsis". Palaeogeography, Palaeoclimatology, Palaeoecology. 296 (3–4): 389–413. doi: 10.1016/j.palaeo.2010.08.001. ^ a b Wilson, M. A.; Palmer, T. J. (2006). "Patterns and processes in the Ordovician Bioerosion Revolution" (PDF). Ichnos. 13 (3): 109–112. Bibcode: 1998Ichno...6..141C. doi: 10.1080/10420940600850505. Archived from the original (PDF) on 2008-12-16. ^ Vinn, O.; Mõtus, M.-A. (2012). "Diverse early endobiotic coral symbiont assemblage from the Katian (Late Ordovician) of Baltica". Palaeogeography, Palaeoclimatology, Palaeoecology. 321–322: 137–141. doi: 10.1016/j.palaeo.2012.01.028. Retrieved 2014-06-11. ^ Garwood, Russell J.; Sharma, Prashant P.; Dunlop, Jason A.; Giribet, Gonzalo (2014). "A Paleozoic Stem Group to Mite Harvestmen Revealed through Integration of Phylogenetics and Development". Current Biology. 24 (9): 1017–1023. Bibcode: 1996CBio....6.1213A. doi: 10.1016/j.cub.2014.03.039. PMID 24726154. Retrieved April 17, 2014. ^ Bergström, Stig M.; Bergström, Jan; Kumpulainen, Risto; Ormö, Jens; Sturkell, Erik (2007). "Maurits Lindström – A renaissance geoscientist". GFF. 129 (2): 65–70. doi: 10.1080/11035890701292065. ^ Wilson, M. A.; Palmer, T. J. (2001). "Domiciles, not predatory borings: a simpler explanation of the holes in Ordovician shells analyzed by Kaplan and Baumiller, 2000". PALAIOS. 16 (5): 524–525. doi: 10.1669/0883-1351(2001)016<0524:DNPBAS>2.0.CO;2. ^ Redecker, D.; Kodner, R.; Graham, L. E. (2000). "Glomalean fungi from the Ordovician". Science. 289 (5486): 1920–1921. Bibcode: 2000Sci...289.1920R. doi: 10.1126/science.289.5486.1920. PMID 10988069. ^ Young, Seth A.; Saltzman, Matthew R.; Ausich, William I.; Desrochers, André; Kaljo, Dimitri (2010). "Did changes in atmospheric CO2 coincide with latest Ordovician glacial–interglacial cycles?". Palaeogeography, Palaeoclimatology, Palaeoecology. 296 (3–4): 376–388. doi: 10.1016/j.palaeo.2010.02.033. ^ Melott, Adrian; et al. (2004). "Did a gamma-ray burst initiate the late Ordovician mass extinction?". International Journal of Astrobiology. 3 (1): 55–61. arXiv: astro-ph/0309415. Bibcode: 2004IJAsB...3...55M. doi: 10.1017/S1473550404001910. hdl: 1808/9204. ^ Holland, Steven M; Patzkowsky, Mark E (2015). "The stratigraphy of mass extinction". Palaeontology. 58 (5): 903–924. doi: 10.1111/pala.12188.